This piece was inspired by the bravery of my niece, Maggie Cravens, a nurse who stayed with her patients as an F4 tornado bore down on the hospital where she worked in Louisville, Mississippi, on April 28, 2014. The hospital was destroyed, but Maggie’s strength saw her through the ordeal and none of her patients was injured. 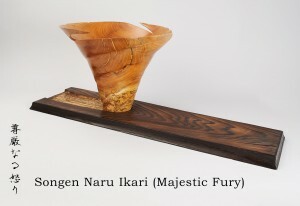 The piece is made of Spalted London Plain salvaged following Hurricane Sandy. The base is cypress finished in the ancient Japanese technique of Jin di Sugi.